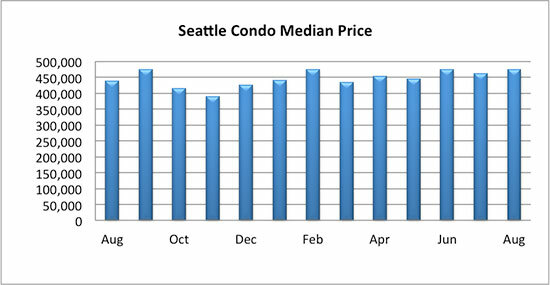 After a little slump in July the Seattle condo market bounced back to end the summer. 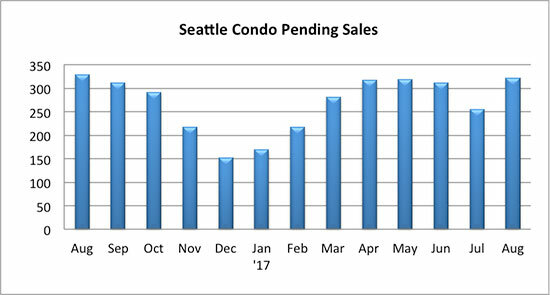 Median sale prices and condo sales activity improved, though sales still lagged behind 2016 with less inventory available for buyers. 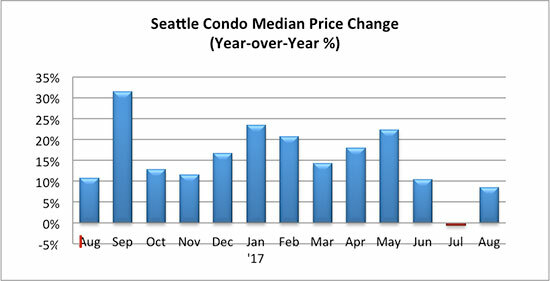 The citywide Seattle condo median sales price rose 8.57% year-over-year to match the all-time high of $475,000. 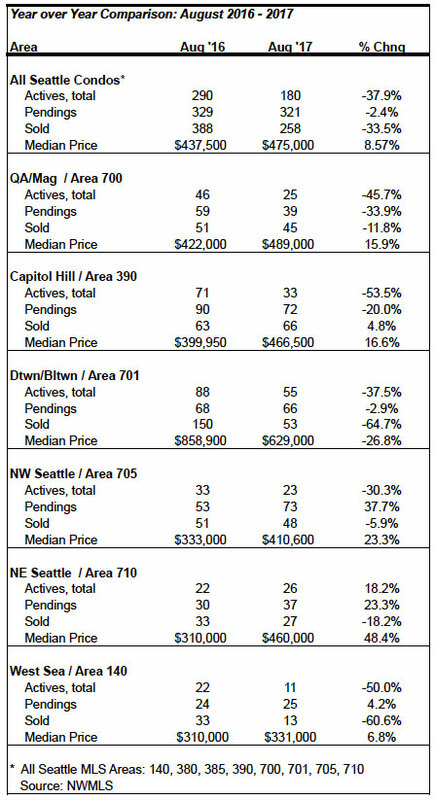 All areas of the city experienced year-over-year increases, most by double-digits, with the exception of the downtown/Belltown district (see table at bottom of article). Downtown/Belltown realized a -25.8% drop in median sales price to $629,000, but that’s primarily from the completion of Insignia’s North Tower last year, which accounted for 61% of the downtown closings a year ago. 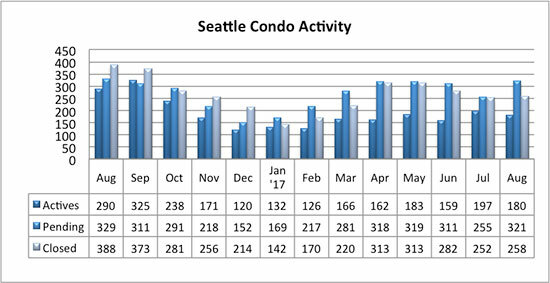 Comparing resale transactions between August 2016 & August 2017, the downtown/Belltown area realized a 31% increase in median sales price. Inventory tapered as we’d expect heading into the second half of the year with listings declining 37.9% to 180 units. Though, if history is any indication then we’ll see an increase in September before winding down for autumn and fall. 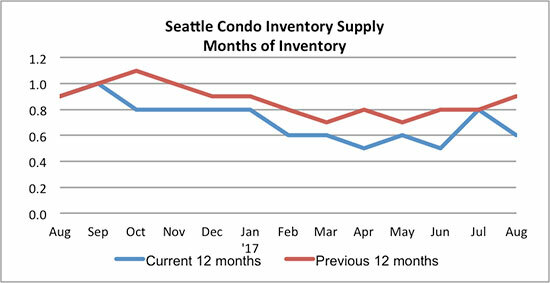 With fewer Seattle condos for sale last month the inventory supply rate reduced to 0.6-months of supply, tightening an already difficult market for buyers even further. The number of pending sales transactions, that is listings with accepted offers reduced slightly to 321 units compared to the same period last year, though it did reflect a one-month increase by 25.9%. As condo listings constrict, so too will the number of pendings. 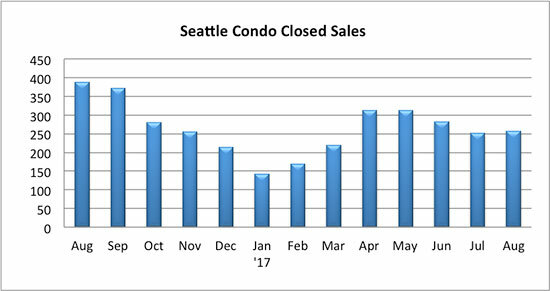 Closed transactions also realized a one-month improvement to 258 units. That’s 33.5% fewer than we had last August, but again, last year’s closing were higher due to the completion of Insignia’s North Tower.